Magan Sangrahalaya Samiti (MSS) is a non-government, social-service organization that started its work in 2003 and is committed to the empowerment of women in rural communities in Seloo Block of Wardha district in Maharashtra. Over the years Magan Sangaralaya has supported several women’s Self-Help Groups and helped in starting up various eco-friendly micro-enterprises run by women in their own villages. Recently MSS has started a program, inspired by the national campaign of ‘Clean India Mission’ -to eradicate the problems of open defecation. Focus Area(s): Women Empowerment, Health and Eco-friendly Development. Due to extreme poverty, aggravated by adverse impact of climate change on its local crops, and lack of livelihood opportunities, Magan Sangrahalaya Samiti decided to form Self-Help Groups (SHGs) of women in the 100 villages in Seloo. These groups trained other SHGs in turn and started several micro-level rural enterprises in these villages. However, poor infrastructure facilities: bad roads, absence of public transportation, irregular electricity supply and shortage of portable water in these villages, hindered the setting up of successful operation of these enterprises. A budding story was turning into a tragedy about a decade ago, until IDRF came to their rescue. MSS has been selected by the Government of India as a nodal training center for organic farming. 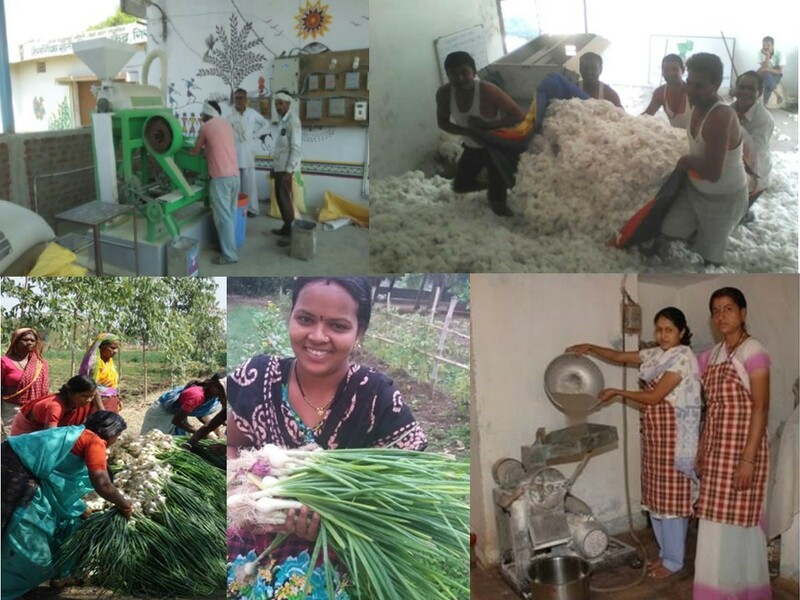 At present the rural enterprises are providing sustainable livelihood to around 500 rural women and reaching out to thousands of women in 1,000 villages of Seloo block through 1,000 SHGs. In 2007, IDRF gave financial assistance for the construction of the building for the “Center for Organic Farming” in Girad village. This building accommodates the office, training and meeting hall, storage of organic farm produce, seed-bank, machines and equipment for processing pulses, cereals, spices and oil, and farm-tool workshop. Over the last few years the activities at the center have increased manifold and all the rooms have been occupied. Due to lack of space a few processing machines and farm-tool workshop had to be shifted outside the building in a temporary shed and the office space (hall) was used for the farmers’ school. However, this hall is not spacious enough to accommodate the increasing number of activities as well as the increasing number of participants. The use of office space interrupts with the office work and threatens the safety of the organization’s records. With IDRF’s financial assistance, MSS has tried to overcome this problem of space by constructing a separate building for Farmers’ School and other community based activities alongside the Organic Farming building. This annex is being constructed as an eco-friendly structure with the use of mud-terracotta technology and will be fully solarized to run lights, fans, computers and projectors on solar power. This eco-friendly structure will be able to showcase an elegant, durable, thermally comfortable and energy efficient building to the villagers and will be symbolic of holistic organic living.